Every haircut comes with a free consultation with one of our experienced stylists, shampoo with scalp massage, blow-dry & style. We also offer our men a range of Barbering services which include 15 min Facials, full & partial shaves and hot towel treatments. Styling services are a great way to give yourself a treat. Perfect for just a casual night in or a formal night out! Our experienced staff will have just the right style for you. Hot Towel Treatment comes with shaves and facials! Every Men's Haircut comes with a personal consultation, shampoo with scalp massage & haircut. We also provide some great grooming add on's such as Full or Partial Shaves, Facials & Hot Towel Treatments. Prices are subject to vary due to hair. Please feel free to call for a consultation. Do you want red, blond, blue or black we have the color for you. Raging from subtle to extreme we can do it all. Chemical services include a free consultation from our educated colorists, shampoo with scalp massage & a prescription for at home hair color care. Keratin Complex Infusion provides deep penetrating action to repair and revitalize hair during blow drying or ironing. $100 per ounce. Ounces used varies on hair mass. Please call for your consultation. This therapy is the foundation of Keratin Complex – the original, in-salon service that infuses natural keratin deep into hair’s cuticle. This revolutionary therapy eliminates up to 95% of frizz and curl and instantly adds amazing shine, silkiness and condition to the hair. The results are astounding. Clients rave that “this is a life-changing experience”. Hair is more manageable, smoother and easier to style than ever before. It is perfect on all types of hair – including color treated and chemically processed hair! INTENSE Rx repairs damaged, over highlighted, processed, permed, straightened or relaxed hair. 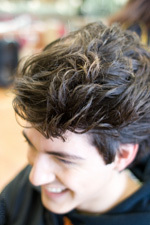 An initial salon treatment will restructure and INSTANTLY relieve damage. Continuing with a daily application will ensure longer lasting healthier hair. INTENSE Rx also serves as a follow-up treatment to our Keratin Complex Smoothing Therapy Treatment to ensure longevity. If you would like to try long hair out for size, come in for a consultation. We have several hair extension specialists who can make your short mane long, add some volume, or just spice up your color. Please call to make an appointment for a consultation. Call for a detailed consultation! We use Great Lengths and Cinderella hair extensions. There is a wide variety of color and length choices. Whether you want your hair thicker, long, or mabe just a chunk of peek-a-boo color, extensions could be the answer for you. Say Hello to the FUTURE! Shellac is the breakthrough, patent pending, UV3 technology that combines the ease of polish with the permanence of gels. A true innovation in chip-free, extended-wear color! Shellac applies like polish, no pots, just a bottle and brush. Removal is just 10 minutes! No filling, no drills! The results you ask? 14 day, glorious, high-gloss shine thats truly addictive! Backscratchers Extreme Nails are a mixture between fiberglass and acrylic and are non damaging to the nail. Full set Cuticles clipped and treated work is guaranteed. Fill Ins Cuticles clipped, treated & repairs are FREE. Most of the stylists at Dallas and Company will do any facial waxing. Dana Bennett offers her clients from head to toe waxing in a private environment, to calm those nerves. Call now for a personalized lash consult and pricing! Dana Bennett and Sandi Simpson are both certified & licensed Xtreme lash consultants. Feel free to give the salon a call for more information! You can expect your initial eyelash extension procedure to be scheduled for up to 3 hours. This time allows you to rest and be pampered as your Xtreme Lashes® Lash Stylist transforms your lashes to the customized lash look you have selected. With Xtreme Lashes' diverse inventory of over 600 individual styles of eyelash extensions, you and your stylist can design a tailored look to compliment your natural beauty. Chosen the #1 Spray Tanning Solution by Salon Professions, Norvell sunless spray tanning products are the choice of professionals around the globe. Each product is formulated to deliver not only a Just off the Beach™ natural tan, but a healthy skin treatment as well. A custom spray tan is a 1-on-1, personalized, spray tanning session with a professional sunless technician. The spray tech, using a high-pressure spray gun, will apply sunless solution to the areas you desire during your scheduled session. Sessions often include full-body application, legs only, or facial sprays. By allowing a professional to apply the spray solution you can ensure a flawless even application, especially on hard to reach areas such as the back. Sunless sessions usually last around 15-30 minutes (this includes drying time) and results can be expected to last 5-7 days. Brandi Ludden is a licensed Esthetician who offers Facials, body waxing & Make Up services. Brandi Ludden is a licensed Esthetician with over 5 years of experience. She offers facials, makeup, waxing, spray tan & so much more. She uses Skinscript and Novell product lines. Feel free to contact her for all your esthetic needs.